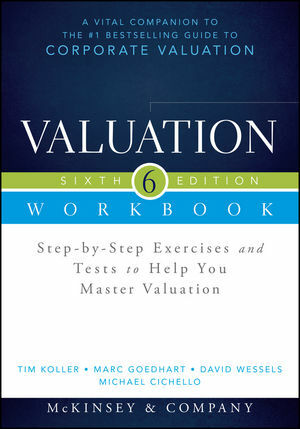 Valuation Workbook is the ideal companion to McKinsey's Valuation, helping you get a handle on difficult concepts and calculations before using them in the real world. This workbook reviews all things valuation, with chapter-by-chapter summaries and comprehensive questions and answers that allow you to test your knowledge and skills. Useful both in the classroom and for self-study, this must-have guide is essential for reviewing and applying the renowned McKinsey & Company approach to valuation and reinforces the major topics discussed in detail in the book. Fully updated to align with the sixth edition of Valuation, this workbook is an invaluable learning tool for students and professionals alike. Valuation has become central to corporate financial strategy, and practitioners must be exceptional at every aspect of the role. There is no room for weak points, and excellence is mandatory. This workbook helps you practice, review, study, and test yourself until you are absolutely solid in every concept, every technique, and every aspect of valuation as demanded in today's economy. Designed specifically to reinforce the material presented in the book, this workbook provides independent learners with the opportunity to try their hand at critical valuation skills, and helps students master the material so they can enter the job market ready to perform. For financial professionals and students seeking deep, comprehensive understanding, Valuation Workbook is an essential part of the McKinsey Valuation suite. McKINSEY & COMPANY is a global management-consulting firm that serves across a wide range of industries and functions. TIM KOLLER is a partner in McKinsey's New York office, where he leads a global team of corporate-finance expert consultants. MARC GOEDHART is a senior expert in McKinsey's Amsterdam office and leads the firm's Corporate Performance Center in Europe. DAVID WESSELS is an adjunct professor of finance at the Wharton School of the University of Pennsylvania. MICHAEL CICHELLO is a faculty member at the McDonough School of Business at Georgetown University.